The real benefit in whois, is that it will save you a trip to your browser. 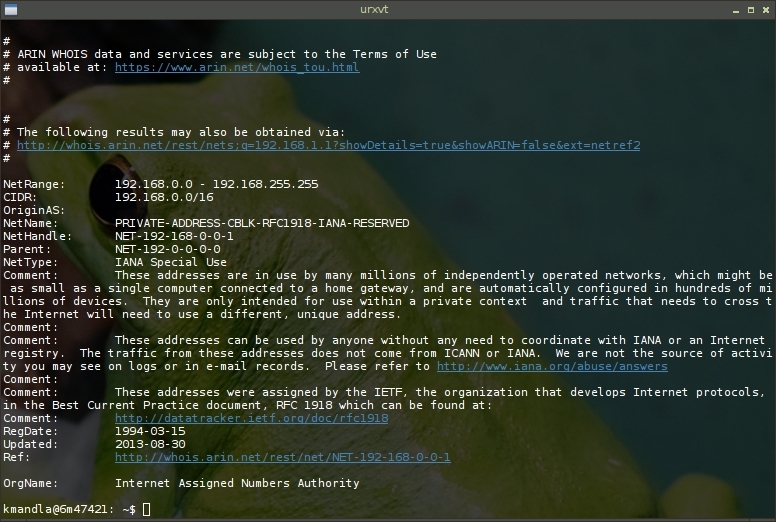 In a time when most everything is clotted into browsers and online packages, burdened with every conceivable junk programming requirement and bundled with insecure software support, whois does a darned good job of getting the information you want, and getting out of the way again. I daresay, but of course I can’t check, that the information you glean from whois will be identical to almost any online whois tool, and it will likely be of more use than a browser-based version. Definitely faster. whois handles a sizeable list of options, which should allow you to prune your results down considerably. At the default, whois usually returns a hefty report and you are left to whittle it down with outside tools. But short of providing the information available online, whois doesn’t do much more. The beauty is the cleanliness and purity of the product it delivers, without any clutter or unnecessary waste of time. This entry was posted in Linux and tagged download, information, network, system on 2014/06/30 by K.Mandla.